We understand how tough it can be to find dog chews that are not only long lasting, but also all natural. That's why we've created a masterpiece with our 100 percent natural bully sticks. 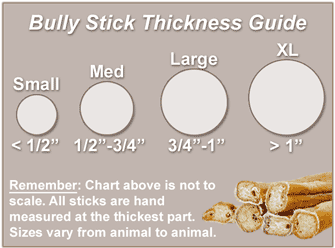 Now available in an extra-large thickness, our 12" Straight Bully Sticks are perfect for satisfying dogs of all sizes. Whether you have a mammoth St. Bernard who needs a durable dog treat or a smaller terrier who simply loves to chew, our jumbo bully sticks are perfect for indulging your furry friend's natural chewing instinct. We're well aware of the "natural" phenomenon that's taking place in our society. It's stamped on practically everything in sight, from frozen meals to laundry detergent. While that's great that your favorite frozen pizza is touting their "natural" product, we're over here boasting about how our bully sticks are the real deal. Unlike so many other dog chews on the market, we make our bully sticks with one ingredient and one ingredient only: the tastiest, all natural beef known to man (and dog). We don't use any artificial flavors, preservatives or hormones during the manufacturing process, providing your pup with the best-tasting natural dog treat ever made. How do we get such a great tasting dog treat? It's easy--we simply roast each bully stick in its own juices to soak up that delicious, savory beef flavor. The result is a dog chew that's unlike any other, with a flavor your pup won't be able to resist. Rather than shelling out your savings on tons of doggie dental products, our bully sticks are great for cleaning your dog's teeth and gums. That repetitive chewing motion helps to naturally clear away harmful plaque and tartar buildup, meaning your pooch will stay happy and healthy as he gnaws away on his favorite treat. Another bonus? Our monster bully sticks are naturally low in fat and high in protein to make your pup a hunk instead of a chunk. And as an added benefit for doggie moms and dads, these yummy bully sticks are low-odor. Because they're sourced from the best all natural beef muscle, our XL bully sticks are designed to stand up to even the most aggressive chewers. The lifespan of these jumbo dog chews will vary depending on how much your pup likes 'em, so be sure to stock up with our bulk buying options. We guarantee your pooch will love these delectable, healthy treats.